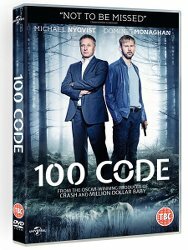 Universal Pictures (UK) are releasing exciting, dark and intelligent crime drama 100 Code on Digital Download and DVD on 28th March 2016. Created by Academy Award winner Bobby Moresco (producer of Crash, Million Dollar Baby) this big budget series co-stars Dominic Monaghan (Lost, Lord of the Rings) and Michael Nyqvist (Mission Impossible: Ghost Protocol). New York. Stockholm. Over the course of the last 12 months, young, blonde and blue-eyed women have been turning up dead in a field of asphodel flowers. Through a special dispensation from the NYPD, Detective Tommy Conley (Dominic Monaghan) is given permission to observe and advise the Stockholm PD. Upon his arrival in Sweden, he is paired with Mikael Eklund (Michael Nyqvist), a by-the-book, Swedish cop with an aversion to American grab-and-go culture. Despite their obvious personality clash, as the killings continue they are forced to straighten out their differences in the thrilling hunt to find the murderer. A complex network of ruthless murderers is revealed as the investigation unfolds, and Conley and Eklund come closer to discovering who is pulling the strings behind the killings. Ambitious in its scale, 100 Code results in a truly intelligent and exciting watch filled with suspense. To celebrate the release of 100 Code we’ve got 5 copies of the DVD to give away. All you need to do to be in with a chance is answer the following question. The competition closes at 23.59 (GMT) on Thursday 7th April 2016. Winners will be selected at random. By entering into the competition all entrants agree to be bound by the terms and conditions. All information provided by the entrant must be accurate and proof of age may be requested. Entertainment Focus does not allow collective or proxy entries. Entertainment Focus reserves the right to change or withdraw this competition without notice. Entertainment Focus will not pass your details to any third parties and will be used solely for communication regarding this competition. Winners will be notified via email or phone (or where applicable) social media (depending on the type of competition). In the unlikely event the prize style has discontinued a similar model to the same value will be provided. There is no cash or other alternative to the prize stated and the prize is not transferable. No part or parts of the prize may be substituted for other benefits, items or additions. Entertainment Focus’ decision is final – no correspondence will be entered into.